I was moved to tears, as others were. And I was so glad my kids were there to see this: so that they could know that this is who we are, this is what we do, this is how we see things and act upon them; this is the way our faith overturns the so-called wisdom of the world, with radical love and outrageous grace. The homily was given by Becky Tyler, a young woman with cerebral palsy. She delivered it from centre stage in a shocking pink wheelchair, using the movement of her eyes to trigger words on a computer in the way Stephen Hawking does. She used it to address thousands of people gathered in a field. They in turn gave her a standing ovation. But that would only be a gesture if it were not for what she said. Someone being given a voice is one thing. When they use it to deliver words of wit and wisdom that unlock who we are as humans and offer new hope, new grace, that is something so beautiful it almost hurts. Becky spoke about being the way she is because someone made mistakes when she was born. That was how she put it. But then she flipped it round to say that whatever mistakes are made – by others or by you – and whatever people say about your worth – or lack of it – and whoever you are, you are loved. Truly loved. I hope I’m quoting her right. That is what I remember, but I was crying at the time. Coming from her, the message seemed as if it might actually be true. Approaches to disability usually start and stop at the level of accessibility. For its main communion service, the festival brought this inclusiveness into the centre of the eucharist. The service was led by three cantors, all wheelchair users; part of the music was provided by Rhythmicity, a drumming group that includes people with additional needs; Livability, a Greenbelt partner, provided three signers; and the prayers were led by two people from L’Arche, the charity for people with learning difficulties. You had to be there. Afterwards, as we went about our business, people were visibly shredded, disturbed, inspired, unsettled … but glad. Other things were great about Greenbelt too. The sun shone. The site never felt better run. For myself, it was a privilege to chair a current affairs discussion and a debate on Brexit that tried to model the notion that whoever we are – however much we disagree, passionately – we can recognise the worth in each other. And also to talk about The Boy Who Gave His Heart Away, which is now coming out in paperback. But it was the Communion that got me. Greenbelt has been my spiritual cradle, my comfort and the pricker of my conscience for many years, although it has also been uncomfortable to be part of at times. Home is sometimes where the hurt is. 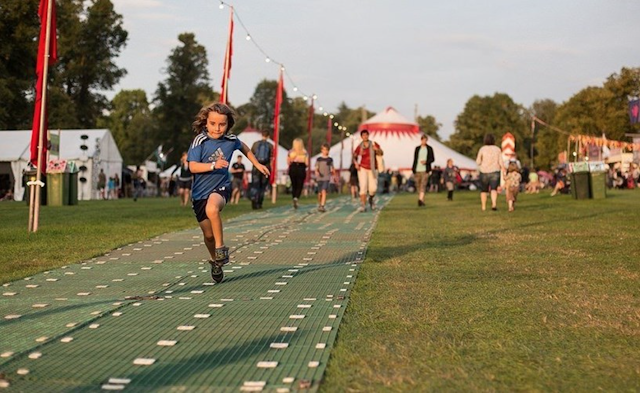 I’ve never been on the board and I don’t speak for the festival, but I know there have been many conversations in recent years about how Greenbelt should be in a shifting world. I’ve had things to say about that myself. Having written a book taking the spiritual temperature of the nation, as the Observer put it, I have long argued that Greenbelt is actually at the vanguard of what’s happening, in that it exists beyond the old notions of church and gives people space to explore doubt, ask questions, make new connections, look up and see the way we could be. It’s just messing about in a field. A festival is a festival. This one is far from perfect. But you won’t find people arguing here that someone is excluded from the love of God because of their religion, colour, gender, sexuality or body. What kind of love would that be? Instead, Greenbelt is now asking – publicly, loudly, officially, in action as well as words – what if we really are all loved equally? How should we then live? In the face of all the pain, exclusivity and judgment generated elsewhere, what happened this weekend felt like an amazing, liberating moment. A start, at least, on a big adventure. Greenbelt feels like home again. A travelling home. We’re on our way to find out more about that outrageous grace.